We created this visualization technique in 2007. Martin Wattenberg & Fernanda Viégas, InfoVis 2008. 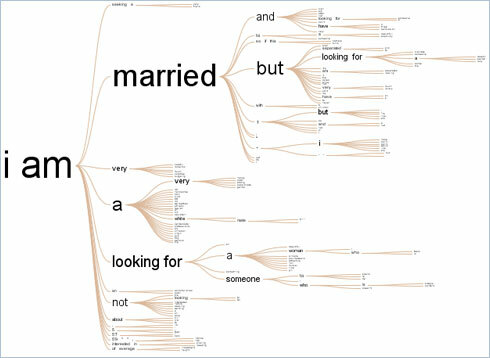 A word tree is a visual search tool for unstructured text, such as a book, article, speech or poem. It lets you pick a word or phrase and shows you all the different contexts in which it appears. The contexts are arranged in a tree-like branching structure to reveal recurrent themes and phrases. 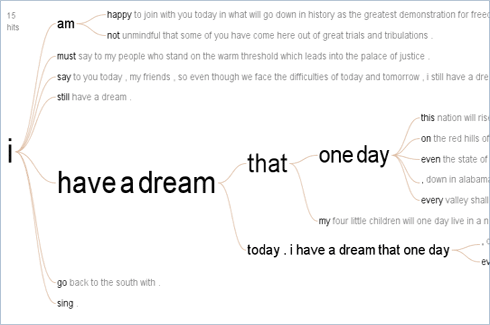 The image above is a word tree made from Martin Luther King's famous "I have a dream" speech, using the search term "I." Font sizes show frequency of use, so you can see that among King's many uses of "I," the most frequent context is the phrase "I have a dream."